Coalburg Racing Promotions has announced the dates for their popular Southern Footbrake Challenge held in Mississippi as well as the World Footbrake Challenge in Bristol, Tennessee, with both events again sponsored by BTE Racing. 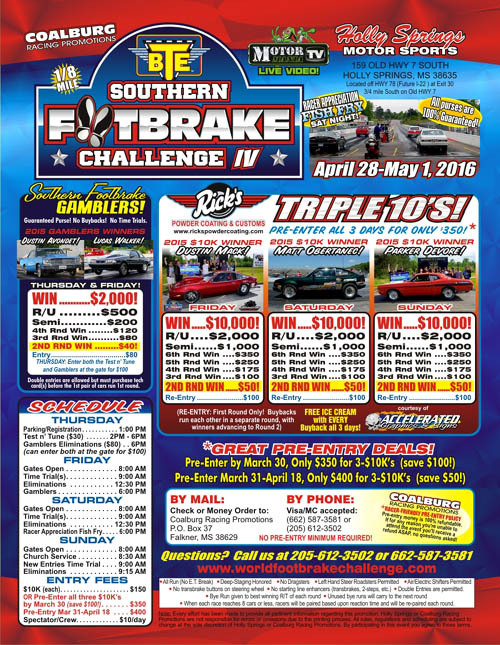 For the fourth straight year, the Southern Footbrake Challenge will be held on April 28-May 1, 2016 at Holly Springs Motorsports in northern Mississippi. Three $10,000-to-win races highlight the weekend in addition to two Southern Footbrake Gamblers Races with the folks from MotorMania TV on hand to stream all of the action all over the world-wide-web. "We are so pleased to announce that Rick's Powder Coating has also signed on as the presenting sponsor for the Southern Footbrake Challenge," said co-promoter Jared Pennington. "Rick's can handle all types of powdercoating as well as ceramic and the latest hydro-dipping processes. A big thanks goes out to Rick Taylor for coming on board which is also enabling us to increase our semifinalist money and all five races will pay second round winners as well." The same great Saturday night Racer Appreciation Fish Fry is free to attend for anyone and Accelerated Graphics will provide free ice cream for anyone buying back in any of the Triple 10s. The 10th annual BTE World Footbrake Challenge presented by Yukon Gear and Axle returns once again to beautiful Bristol Dragway on July 7-10, 2016. The format will remain the same with three main events paying $10,000-to-win on Friday and Sunday, with $20K up for grabs on Saturday. Two World Footbrake Gamblers races will take place on Thursday and Friday, and as is common for all Coalburg Racing Promotions events, all of the purse money is 100-percent guaranteed. "Yukon Gear and Axle signed up as a round prize sponsor with us for the first time in 2015 and they were so impressed that they decided to up the ante and become the presenting sponsor of the WFC X, and we're so happy to have them on board," says Pennington. The famous WFC Saturday night Racer Appreciation BBQ will once again feed anyone in the house and Huntsville Engine and Performance will be providing free ice cream for all having to buyback. Both events this past year saw increased attendance which has led up to these events being the highlight of the yearly footbrake racer's schedule. 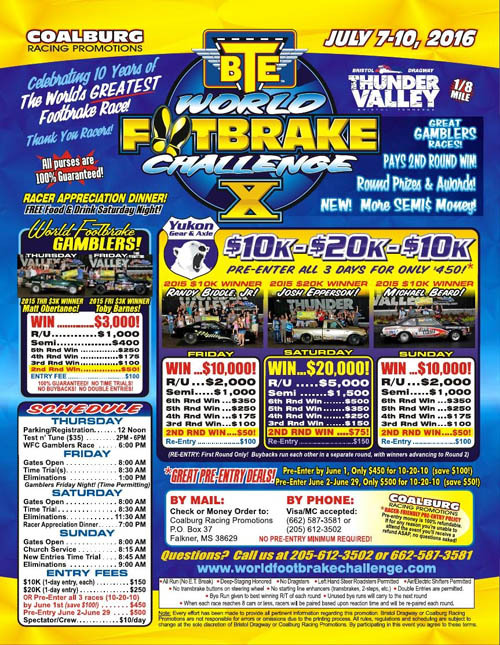 There is a reduced entry fee for pre-entries which can be done by logging onto www.worldfootbrakechallenge or by calling 205-612-3502, and as is another Coalburg Racing Productions rule, all pre-entries are 100-percent refundable for any reason. Saving money is always a good thing and both events last year saw roughly 75-percent of the racers pre-enter and for good reason. For more information on the BTE Southern Footbrake Challenge and the BTE World Footbrake Challenge, visit www.worldfootbrakechallenge.com and "Like" the World Footbrake Challenge on Facebook.